Musical tastes are such an interesting and individual thing. Everyone has a few bands they own everything ever produced and have seen them several times in concert (in my case, Journey and Yes). And then there have always been bands I was a fan of, but didn’t necessarily own a ton of albums from. It’s like you know their radio hits, maybe listen to some of their stuff online, maybe have an album or two, but don’t really explore their catalog much deeper than that. You like their music but couldn’t quote lyrics from the fifth song of an obscure album like a band’s serious fans can do. Maybe these are the bands you’d like to see in concert just once–just to hear those hits, to see how good they are live, just to say you did. Elton John, The Scorpions, Van Halen fit into this category for me. 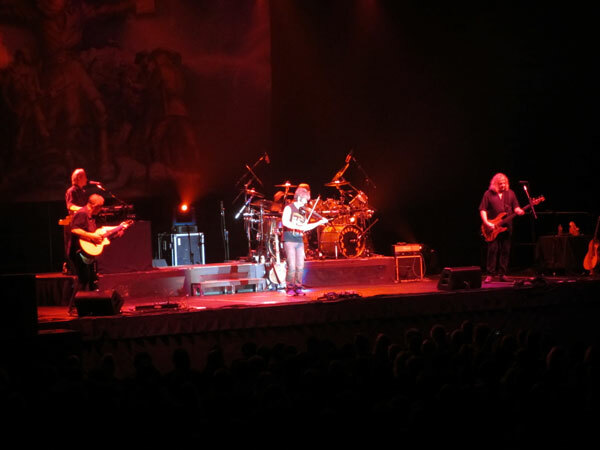 Which brings us to Kansas, the band best known for use of violin in their songs and performing huge 70’s hits such “Dust in the Wind” and “Carry On Wayward Son”. Their first album was released in 1974 (I was like 5 years old at the time). Over the years I bought a few of their albums (Leftoverture was one of the first albums I heard as a teenager that made me go “wow, this is amazing!! !”), and while listening to Pandora online I discovered some great stuff of theirs that was a little deeper on albums I didn’t own or weren’t in heavy rotation on rock radio at the time. Fast-forwarding to 2013, and looking for a concert to go to after gracefully agreeing to go to Maroon 5 (boringly chronicled in a recent blog post or two)…Kansas was coming to UTA. Tickets were inexpensive (relatively, anyway), it’s a 10-15 minute drive from my house, I know quite a few of their songs…too good to turn down, right? 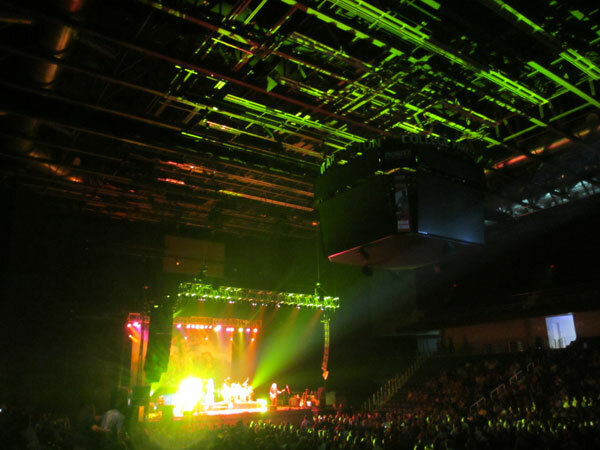 Plus, I was also interested to see how College Park Center performed as a concert venue. After a wonderful-as-always dinner at David’s BBQ on Park Row, it was showtime. NYC-based Arc and Stones opened the show with very energetic set. I think I read they were listed as one the top 20 independent bands or in a recent poll or something. Apparently they’re just kind of getting their career but sounded as tight as a band that’s been together for a long, long time. Some articles I’ve read about them have compared their music to Black Keys and Kings of Leon, but at least live, I was hearing more than just a little Soundgarden/Pearl Jam influence as well. And maybe a bit of Lenny Kravitz too. And kind of a recurring blues/southern rock vibe as well. After a short intermission to get the stage ready, Kansas started their set. I’m estimating the attendance was maybe 2000-2500 or so–the upper level was curtained off, but just about all of the seats on the floor and lower balcony sections near the stage were very full. The crowd was on their feet during the hits and you could tell genuinely enjoyed every note of the show, but overall it seemed like a surprisingly pretty laid back vibe…not the “I’m seeing my favorite rock-and-roll band and it’s time to paaaaartyyyyyyyyy” vibe you usually get at an 70’s-80’s arena show (maybe the size of the venue compared to crowd size had something to do with it? Would Texas Hall have been a better fit?). A huge image of their “Kansas” album served as the stage backdrop. The colorful lighting worked pretty well for each song. The band played about 90 minutes including the encore–13 songs I think, not much in the way of intros or stories or chatter between songs. It was a real treat getting to hear them do “Carry On Wayward Son”, “Dust in the Wind”, “Song for America” and a few others. Some of the songs I hadn’t heard in a long, long time. And there were a few songs like “Icarus” and “Journey from Mariabronn” that I just wasn’t familiar with at all (maybe due to my admittedly casual-fan status). For me, the highlight was “The Wall”, a moving song about the choices we make in life. Always loved that song, one of my favorite tracks from any band ever. Their extended harmonies on “Fight Fire with Fire” were almost Eagles-like in their clarity and perfect execution. Keyboardist Steve Walsh’s vocals were spot-on all evening. David Ragsdale’s violin parts during the songs were pretty clear and note-for-note like the albums, and it’s obvious that everyone in Kansas are exceptionally talented musicians (especially during the instrumental sections). As well as they’re playing now, I can only imagine what it would have been like to have seen them back when they ruling the rock airwaves with other great bands like Styx, The Eagles, Foreigner and Journey. Pretty special, I’m sure. How did CPC perform as concert venue? Not bad for a venue primarily used for sports. The sound was pretty good and not overly bassy like some other arenas/big venues I’ve seen shows at. The vocals and harmonies at times were extremely clear for both bands. The sightlines are very good, there was plenty of parking in the adjacent garages and the concession stands were very efficient. So overall, glad we went…good show. Now: what’s another band coming to town that I’ve never gotten to see but always wanted to? This entry was posted in College Park Center, Concerts, Not UTA basketball by rustyhancock. Bookmark the permalink.